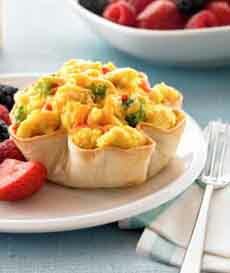 Top: Mexican Scrambled Eggs In Tortilla Cups (photo Land O’Lakes). 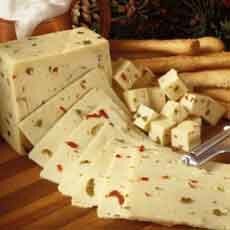 Bottom: Add more heat with Pepperjack cheese (photo Paoli Cheese). We often make a vegetable scramble for breakfast, to a proportion of half egg, half veggie. Bell peppers, mushrooms and onions are our basic mix, along with fresh herbs and halved cherry tomatoes. It’s easy to prep the night before. You can dice the vegetables and beat the eggs in just a few minutes. If you want to add cheese, you can dice, grate or shred it the night before, too. Then, while the coffee brews, heat the pan, combine the ingredients, and voilà. When we have extra time, we make something more elaborate, like these Mexican-inspired scrambled eggs in tortilla cups—a crowd pleaser. 1. HEAT the oven to 400°F. Place four 6-ounce custard cups upside down on a cookie sheet. Lightly spray both sides of the tortillas with nonstick cooking spray. Place the tortillas over the custard cups, pressing down lightly to shape. 3. SPRAY a 10-inch nonstick skillet with cooking spray. Scramble the eggs with the vegetables and seasonings and cook over medium heat. As the eggs begin to set, sprinkle on the cheese. Alternatively, you can sprinkle on the cheese after the eggs are in the tortilla cups. Cook until the eggs are set but still moist. 4. PLACE the tortilla cups on plates and fill them with the eggs. Top each with sour cream and salsa. Sprinkle with green onions and the herbs. *Most recipes assume large eggs; it is the size of the egg that makes the difference: 2 medium eggs =1/3 cup, 2 large eggs = ½ cup, 3 medium eggs + ½ cup, 3 large eggs = 2/3 cup. 4 large eggs = 1 cup. †If you use Pepperjack, you don’t need the added chiles.